In our last blog, we have discussed about Microsoft service Command Line Interface.In that blog we have discussed how to manage and execute powershell command by browser without configuring the local environment.Today we will discuss, how to configure local environment to support Azure PowerShell script and will go through a example, where we will create a new Azure Virtual Machine using Azure Power Shell from local environment. If we have not configured the Azure PowerShell yet, Let’s go through the following steps an configure it before proceeding with our example. 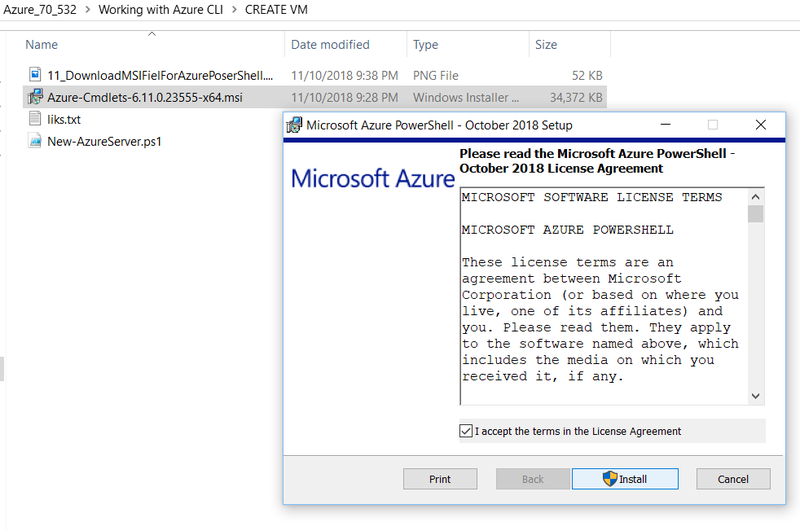 To proceed with the Azure PowerShell configuration, let’s have a little information from the this link.From this link we found, that we can download a MSI file and click on it to install the Azure PowerShell. So please download the Azure-Cmdlets-6.11.0.23555-x64.msi and click on it to continue with the installation, as shown in the following figure. Allow to proceed with the installation, as in following figure. 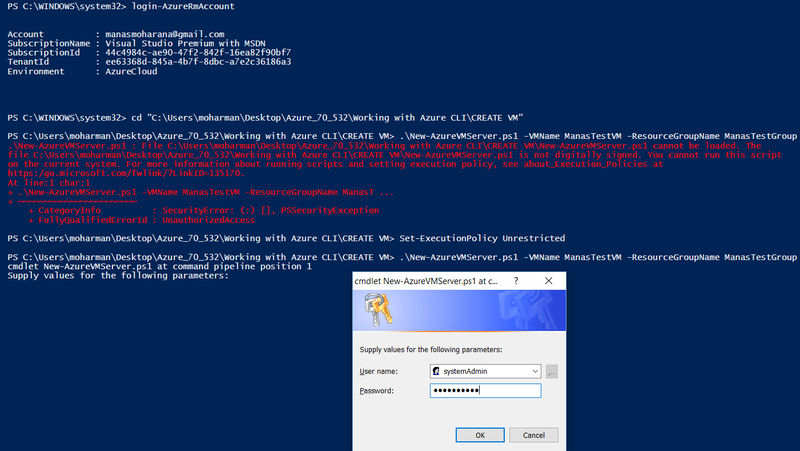 Once the Azure PowerShell installation done, we will lunch Window Powershell and try to connect to our azure account by selecting Always run ,if there is no security issue, as in following figure. 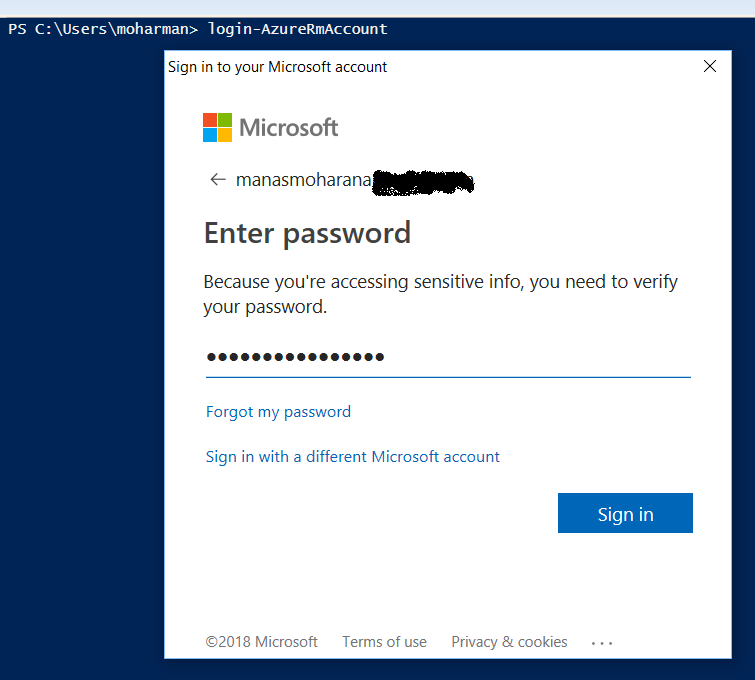 Once every thing went well, it will ask us to provide our azure subscription credentials to connect to our Azure account and once, we are authenticated, we are all set to go with our example, as in following figure. If you have deployments that use the classic deployment model that cannot be converted, you can install the Service Management version of Azure PowerShell. For more information, see Install the Azure PowerShell Service Management module. Now We are ready with our local configuration to execute any powershell script against our Azure Account.as we discussed earlier, today we will move and try to create a new Virtual Machine server using a powershell script.We know that a virtual machine can not be created alone.It has many dependencies like , Resource Group, Stoage Account, Network configuration,IP configuration etc.So before creating the VM , we need to make sure that, all the prerequisites must be in place. I have downloaded a powershell script created by Mike Pfeiffer and did a little modification.In this powershell script Mike has taken care of all the required prerequisites. So lets start with the example and execute the following powershell script by providing required parameters. Write-Verbose "Creating Resource Group if not exist"
Name = "$ResourceGroupName" + "-Subnet"
Write-Verbose "Creating new network subnet config"
Name = "$ResourceGroupName" + "-vNET"
Write-Verbose "Creating public ip config"
Write-Verbose "Creating network interface config"
VhdUri = $StorageAccount.PrimaryEndpoints.Blob.ToString() + "vhds/$osDiskName.vhd"
As Shown in the following figure, We need to provide the required parameters and it will craete all required resources in before hand and then it will proceed to create a new ManasTestVM, as shown in the following figure. When executing the script file, you might face the following script not digitally signed issue, as shown in the following figure.In that case, we can set “Set-ExecutionPolicy” to unrestricted if it is safe, as shown in the following figure. Once we have done with the above configuration, we can re execute execute the script and it will ask you the User Name and Password for the new VM and we need to provide the new username and password, as shown in the following figure. After Some time, we can see our new VM is ready with all configurations, as shown in the following figure.